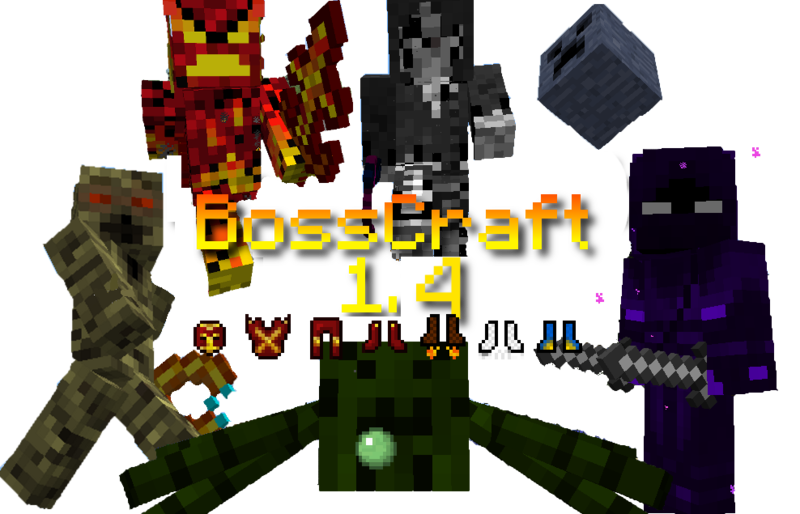 BossCraft is a Minecraft Modification, that adds currently 6 Boss Mobs, and 8 Normal Mobs to your Minecraft World. If you kill the normal Mobs, that will spawn in different Biomes you'll get Biome Orbs ( Desert Orb, Forest Orb etc...) These will help you to summon the Biome Boss! Mummies will Spawn in Desert Biomes in small Groups. They behave like Zombies and are wielding a stone Sword. They're pretty slow and don't do anything special. Rogues are faster than normal Mobs and are wielding Iron Knifes. They spawn in small Groups in Forest and Plain Biomes. In Mountain Biomes you can find these small Blocks, jumping around in the air and creating an explosion when they jump. They can jump up to 15 blocks and spawn usually alone. In Caves, you can find these Fire Spiders. They can only spawn in Darkness, and only in caves. They spawn normally alone. 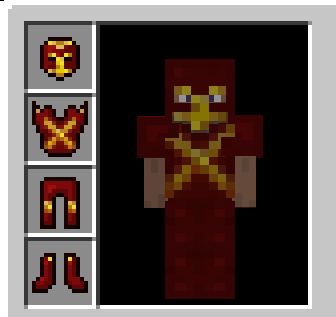 In the Nether, you rarely find one of these Fire Soldiers. They are pretty big and drop Nether Orbs. At Nighttime, you'll find these Wraiths. Once attacked, they'll disappear and you can only see their eyes! They drop Necro orbs when killed! These Scrolls have to be crafted to summon the chosen Biome Boss. All normal Mobs drop specific orbs. For Example Mummies drop Desert Orbs. If you collect enough orbs, you can break the scroll by right-clicking it. (20 Uses) Then the Biome Boss will Spawn! One of the Bosses is the Pharaoh. He wields a golden Staff, which can be dropped when you kill him. He'll randomly jump around through the air, by shooting fireballs at you. The Rogue Master wields two Iron Knifes and spawns randomly normal Rogues. Sometimes he'll jump high in the air or creates Explosions. A harder version of the Creepy Blocks, with 2 states. When his HP are low he'll change to a red flaming Block, which creates fire on the ground, and shoots fireballs a bit faster. The Spider Queen is a giant spider, that creates cobwebs on the ground. She'll randomly spawn normal spiders or cave spiders. She's less gravity affected, than the Player. The Fire Lord is a Giant Fire Soldier with 2 Fire Swords. He'll spawn normal Fire Soldiers, when he's on low HP and creates fire on the ground. The Grim Reaper is a skeleton-like Mob, that will wield a Midnight Scythe. Sometimes, he'll shoot tons of Darkness Balls at you! A Ranged Mage Weapon that will shoot Fireballs! If you hit Monsters or Animals with the Ultimate Hammer, they'll get pushed up in the air. If you right-klick the Ulimate Hammer you'll get pushed up in the air. The Fire Sword is an unbreakable, but low damage Sword. It sets Mobs on fire and when it's on full Durability you can spawn the Magma God. He'll help you fighting against other Mobs for a certain time. After the "special attack" the Durability is pretty low, but if you attack Mobs it'll regenerate again. With the Fire Sword, you can summon this Magma God. He'll drop tons of orbs, that'll create fire on the ground. With the Rogues Knife, you can summon a huge arrow Rain. Many arrows will fall down and kill all Mobs nearby. The Midnight Scythe only has 8 durability. Every hit on a mob will heal you 1 Heart, but to repair it (rightclick) you have to suffer 4 Hearts yourself. The Hellstone Armor can be obtained by killing the Fire Lord. Each kill will give you 1 random piece of this epic Armour set. Full Set will make you immune to Fire! The Boots of Lightness have a 33% chance to be dropped by the Grim Reaper! If you wear them you can jump up super high and you are faster in air. While falling down, you just glide slowly to the ground. You'll never get fall damage. These Boots can be obtained by killing the Rogue Master. You can run twice as fast as usual and you'll leave a track of fire behind you. With these Rocket Boots you are the Hero of the Sky. You can travel up to six times faster than normal and fly up high in the air without fall damage. However after a short time you have to land to fly up again. These boots can be obtained by the Mega Block with a 20% chance. Not all Achievements are included in this list! Only the ones which are available at the moment! Play BossCraft for the first time! Summon the Magma God 5 Times! Drain 100 Life Points with the Midnight Scythe! Get the full Hellstone armor set! 3. Go to Run -> %AppData% -> .minecraft -> bin -> minecraft.jar (open with WinRar etc.) and drag all files in there. Special thanks to Apollo9898 for many awesome Suggestions! This looks very, very cool. I can see this mod becoming something big. I hope you update this mod frequently and keep it going and adding new features. Maybe add A abandon mine spider boss or something along them lines? or add a new jungle boss maybe a monkey or some vine demon thing? iunno, you could have a lot of fun with this lol. I had it edited haha, I realized after I noticed I skipped the bottom part. You should try and implement towers or ruins were boss mobs can be summoned after you clear the enemies and the loot. I can't find any of the custom mobs anywhere? what are the spawn conditions for them like gamemode / daynight etc? Maybe add A abandon mine spider boss or something along them lines? Great Idea! I'm working on it! Sthullen, you make the best mods evah! You should make an Uber boss, which is big, very big. Maybe when you kill all 3 of those bosses, they drop an Uber orb; and you need 3 to make an Uber scroll. This mod looks awesome Can't wait to see how it turns out later!